The 7 train traveling towards Flushing won’t stop at 33rd St. once again. This time, however, I will not quelch my desire for amazing rotisserie chicken like I did yesterday. It is worth the walk to 46th St. (Bliss St.). It’s sunny today in Sunnyside! After a great walk, I reached Riko’s. It was crowded to the gills with families and couples; I was the lone gringa there. Instead of trying something more exotic, or waiting until Pisco Happy Hour special (Pisco = a colorless or yellowish-to-amber brandy from distilled fermented grape juice, into a high-proof spirit, native to both Peru and Chile), I was there for the chicken. I’ve dreamed of this chicken for many months, since my first time here. Lunch special: 1/4 lb. rotisserie chicken, with a side of red beans/ rice or French fries/green salad = $5. 50. For a 1/2 lb., the meal is $8.50. I ordered the beans and rice with the chicken. 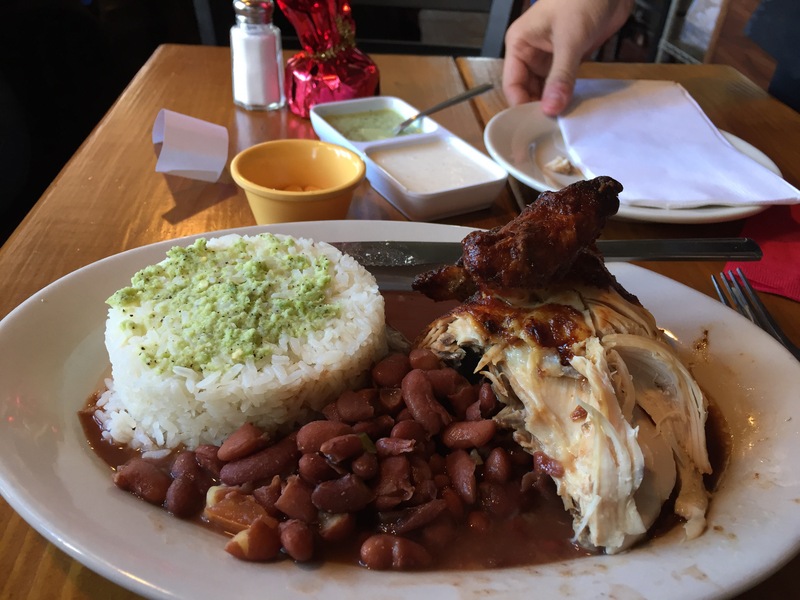 Verde sauce on the rice was very good; the rice was hot and fluffy, the beans were sumptuous, and the chicken….God, it was incredible! I didn’t care how crowded the restaurant was, how narrow the walking path between the tables was, or even when the delivery guy accidently bumped my table with his dolly filled with boxes. (He apologized profusely; the table didn’t knock over, and me and the food were fine. It’s all good, man! The meal made me smile; I was in bliss.